This article was originally published in Healthcare Call Center Times. You can subscribe to the publication HERE. The location of healthcare call centers in the early years of this profession were often not very advantageous. A hospital basement, an unused patient room, a small side room, all of these would house a series of desks crammed together for the use of the call center. What a difference 30 years can make. Today’s call centers are much, much improved, a development that speaks of the growing importance of the call center in our health delivery system. One of those improvements that has come to the call center world in recent years is the desk that moves up or down with the push of a button, says Vicki Neiderheide, Regional Sales Manager for the Spring Lake, Michigan-based Interior Concepts. This standing desk design enables the user to work sitting down or standing up with the work surface staying intact when being moved. These are typically being put in place with larger work stations, five feet wide or even more. This contrasts with the old style workstations 36-48 inches wide. The old style stations were more used in call centers that focused solely on outbound calling. The five foot wide suits much better the modern healthcare call center that handles mostly inbound with some outbound traffic, she says. 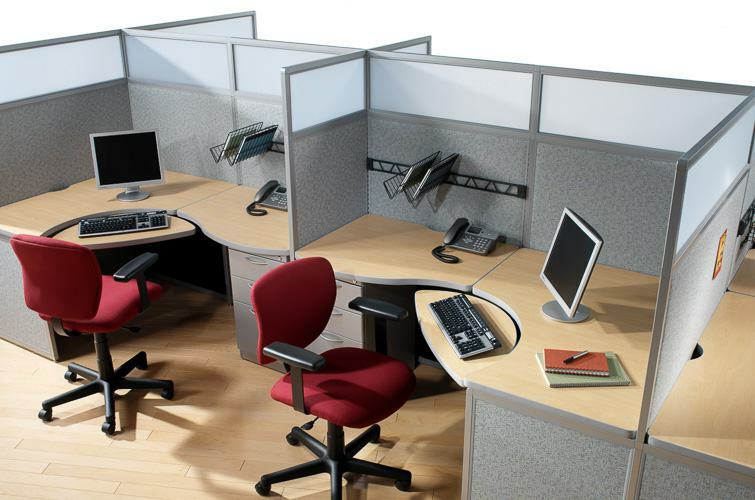 The standard layout for call center furniture that looks like a square or rectangle may be quite adequate for many. However, for some, the cluster concept may make sense for either the entire call center or for at least part of it. In this model, a group of five to six workstations are all in a customer and placed so that they resemble a circle. Agents can work as a team, but each of them faces the center of the circle so they are not seeing each other across a panel. For scheduling call centers that use the office pod system for their division of labor, this concept may resonate. Having a lower panel height can help to provide that feeling. It also can allow for better supervision as the supervisory staff can see what each representative is doing at all times. Another important change in call center layout in healthcare and other industries, she says, is their more casual atmosphere with more space to relax and break rooms that are outfitted much better than in the past. Also the decor is more aesthetically pleasing with wider corridors to provide that sense of space. Lighting has also been improved in recent years with many healthcare call centers having more access to natural light.